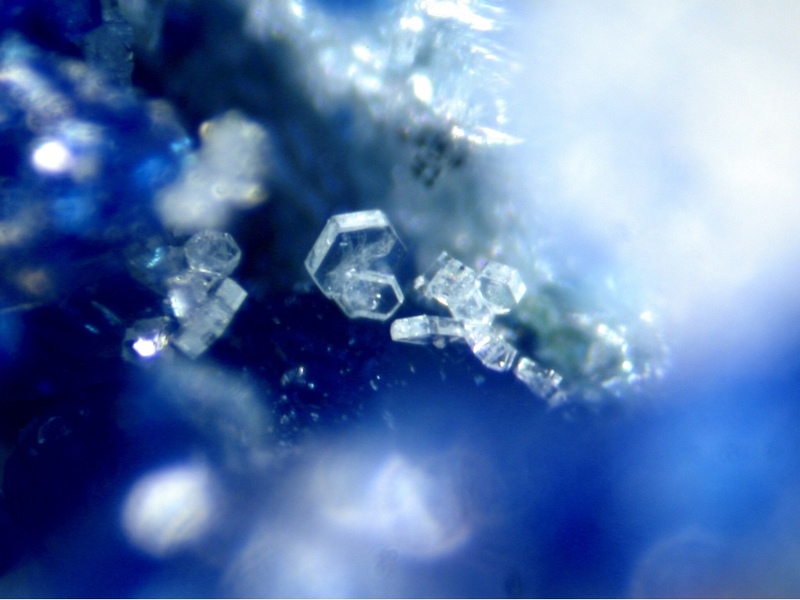 Susannite: Mineral information, data and localities. Named after the type locality, the Susanna Mine, Leadhills, Scotland. The trigonal dimorph of leadhillite. A mineral closely related to leadhillite and macphersonite. Tabular forms of susannite are easily confused with leadhillite. Heating leadhillite causes it to reversibly transform into susannite in the temperature range from 50 to 82°C (Bindi & Menchetti, 2005). Caledonite 23 photos of Susannite associated with Caledonite on mindat.org. Schulenbergite 11 photos of Susannite associated with Schulenbergite on mindat.org. Anglesite 7 photos of Susannite associated with Anglesite on mindat.org. Cerussite 7 photos of Susannite associated with Cerussite on mindat.org. Mattheddleite 5 photos of Susannite associated with Mattheddleite on mindat.org. Cuprite 4 photos of Susannite associated with Cuprite on mindat.org. Bechererite 4 photos of Susannite associated with Bechererite on mindat.org. Hydrocerussite 4 photos of Susannite associated with Hydrocerussite on mindat.org. Linarite 4 photos of Susannite associated with Linarite on mindat.org. Steverustite 4 photos of Susannite associated with Steverustite on mindat.org. Brooke (1827) Edinburgh New Phil. J.: 3: 117 (as Sulphato-tricarbonate of Lead). Haidinger, W. (1845) Zweite Klasse: Geogenide. II. Ordnung. 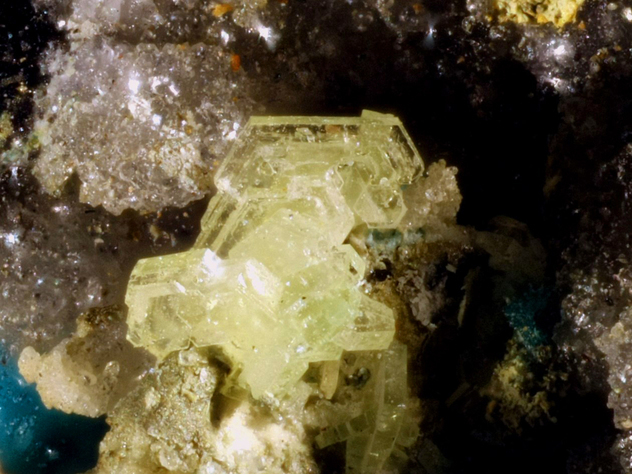 Baryte. VII. Bleibaryt. Suzannit.. in Handbuch der Bestimmenden Mineralogie, Bei Braumüller and Seidel (Wien): 499-506. Palache, C., Berman, H., Frondel, C. (1951) The System of Mineralogy of James Dwight Dana and Edward Salisbury Dana, Yale University 1837-1892, Volume II: Halides, Nitrates, Borates, Carbonates, Sulfates, Phosphates, Arsenates, Tungstates, Molybdates, Etc. John Wiley and Sons, Inc., New York, 7th edition, revised and enlarged: 298-299. Steele, I.M., Pluth, J.J., Livingstone, A. (1999) Crystal structure of susannite, Pb4SO4(CO3)2(OH)2. A trimorph with macphersonite and leadhillite. European Journal of Mineralogy: 11: 493-499. Frost, R.L., Kloprogge, J.T., Williams, P.A. (2003) Raman spectroscopy of lead sulphate-carbonate minerals - implications for hydrogen bonding. Neues Jahrbuch für Mineralogie, Monatshefte: 2003: 529-542. Bindi, L., Menchetti, S. (2005) Structural changes accompanying the phase transformation between leadhillite and susannite: A structural study by means of in situ high-temperature single-crystal X-ray diffraction. American Mineralogist: 90: 1641-1647. The following Susannite specimens are currently listed for sale on minfind.com. Kolitsch, U. (2015): 1930) Leadhillit und Susannit aus den Schlacken der Astenschmiede im Hüttwinkltal, Rauris, Salzburg. Pp. 236-237 in Niedermayr, G. et al. (2015): Neue Mineralfunde aus Österreich LXIV. Carinthia II, 205./125., 207-280. P. Tomazic, F. Bernhard, U. Kolitsch und G. Knobloch (2012): Mineralogie eines historischen Bergbaues auf Eisen und Silber am Arzberg bei Steinhaus am Semmering. Der Steirische Mineralog 26, 4-9. Anais da Academia Brasileira de Ciencias (1983), 55 (3), 263-270. Palache, C., Berman, H., & Frondel, C. (1951), The System of Mineralogy of James Dwight Dana and Edward Salisbury Dana, Yale University 1837-1892, Volume II: 298.; Palache, C., Berman, H., & Frondel, C. (1951), The System of Mineralogy of James Dwight Dana and Edward Salisbury Dana, Yale University 1837-1892, Volume II: 299. Sarp, H. (1984): Seconde occurrence du nouveau minéral Scotlandite PbSO3. Schweiz. Mineral. Petrogr. Mitt., 64, 317-321. KOLITSCH, U. (1997): Uranosphärit und weitere neue Mineralfunde von der Grube Clara im Schwarzwald. 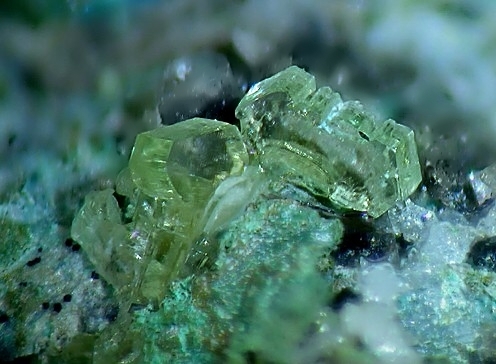 - Mineralien-Welt 8 (3), 18-26; U. Kolitsch, J. Gröbner, G. Blaß and H.-W. Graf (2007): Neufunde aus der Grube Clara im mittleren Schwarzwald (III): Cerianit-(Ce), Dravit, Florencit-(La), Gilmarit, Olenit und Scotlandit. Lapis 32, 19-23, 70. Frost, R. L., Kloprogge, J. T., & Williams, P. A. (2003). Raman spectroscopy of lead sulphate-carbonate minerals–implications for hydrogen bonding. Neues Jahrbuch für Mineralogie-Monatshefte, 2003(12), 529-542. Harms, U. (2010): Sekundärmineralisation von der Grube Josephine in Velbert (Rheinland) - Beschreibung und geochemische Bildungsbedingungen. Decheniana (Bonn) 163, 179-184.
ⓘ Schöne Aussicht Mine ? ⓘ King Arthur Mine ? Palache, C., Berman, H., & Frondel, C. (1951), The System of Mineralogy of James Dwight Dana and Edward Salisbury Dana, Yale University 1837-1892, Volume II: 299.
ⓘ Brae Fell Mine ? Cooper, M.P. and Stanley, C.J. (1990) Minerals of the English Lake District: Caldbeck Fells. British Museum (Natural History), London. ; Green, D.I., Bridges, T.F., Rumsey, M.S., Leppington, C.M., and Tindle, A.G. (2008) A review of the mineralogy of the Roughton Gill Mines, Caldbeck Fells, Cumbria: Part 2 The Roughton Gill South Vein on Balliway Rigg. Journal of The Russell Society, vol. 11, 3-28.
Cooper, M.P. and Stanley, C.J. (1990) Minerals of the English Lake District: Caldbeck Fells. Natural History Museum Publications, London, 160 pp. ; Jackson, B. (1990) Queitite, a first Scottish occurrence. Scottish Journal of Geology, 26(1), 57-58.; Cooper, M.P. and Stanley, C.J. (1991) Famous Mineral Localities: Pyromorphite Group Minerals from the Caldbeck Fells, Cumbria, England. Mineralogical Record, 22(2), 105-121.; Bridges, T.F., Green, D.I., Rumsey, M.S., and Leppington, C.M. (2008) A review of the mineralisation at Red Gill Mine, Caldbeck Fells, Cumbria, England. Journal of the Russell Society, 11, 29-47.
Cooper, M.P. and Stanley, C.J. (1990) Minerals of the English Lake District: Caldbeck Fells. Natural History Museum Publications, London, 160 pp. ; Bridges, T.F., Green, D., Rumsey, M.S., and Leppington, C.M. 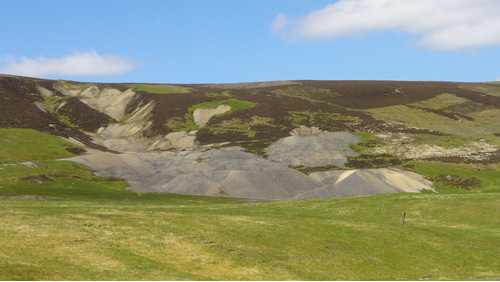 (2011) A review of the mineralisation of the Roughton Gill mines, Caldbeck Fells, Cumbria: Part 3 Roughton Gill Mine. Journal of the Russell Society, 14, 3-23 (referring to Cooper & Stanley, 1990). ⓘ Whitwell Quarry (Whitwell Works) ? vanadinite and descloizite, probably the best yet to be found in England and the secondary lead mineral suite including leadhillite, lanarkite, cerussite, anglesite, pyromorphite, scotlandite, mattheddleite and possibly susannite. Other minerals found were barite, calcite, hemimorphite, and sphalerite. Jackson, B. (1990). Queitite, a first Scottish occurrence. Scottish Journal of Geology, 26(1), 57-58.